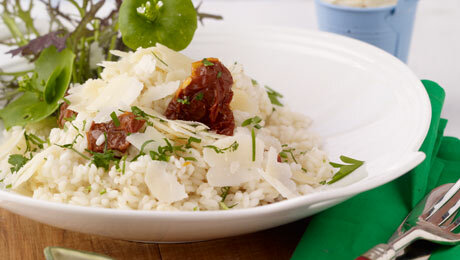 Risotto is a wonderful Italian rice that is generally cooked in stock, I like to add some white wine for some extra flavour – risotto can be a great way to use leftovers such as chicken! It’s important to ensure the stock is hot when added to the rice otherwise the temperature of the dish is decreased and the rice can become too sticky. Choose a wide saucepan with a thick base. On a low heat slowly melt the butter and add the chopped shallots, sundried tomatoes and thyme and cook very gently until completely softened. Add the rice and mix well with the butter ensuring that it does not stick to the base of the pan at this crucial time. Next add the white wine and again, continue to stir the rice as the wine will evaporate off quite quickly. Boil up the chicken stock and add some of this into the rice (the low heat being maintained at all times). Add the stock little by little and never adding the next ladle until the previous one has evaporated. It is vitally important not to rush this process but continue to add all of the liquid until the rice is plump and tender. Add the cream and Parmesan cheese now. Adding just Parmesan will also generate a creamy result.